I recently experienced a magical sea kayaking trip off the west coast of Vancouver Island, British Columbia, at play amongst the grey whales and running salmon. It seems everyone has a healthy appetite for the great outdoors there. I reluctantly boarded the plane back to Oz. Weeks passed back in Melbourne town with a recurring nagging feeling that something was lacking in my life… of course! 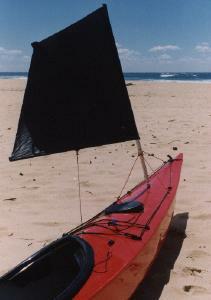 ….. a sea kayak. Always one to make things difficult for myself, I decided to build rather than buy. Being a keen woodworker, naturally my chosen material was wood, inspired by some wonderful examples seen in Canada. I am no expert when it comes to boat building but what follows is a brief description of the strip-building process. Western Red Cedar, Silver Quandong, and King William Pine were selected. Firstly for their strength and lightness, and secondly for the beauty of their colour and grainage. After much deliberation, my chosen craft was a nineteen-foot (5.8m) Expedition Single, twenty one inches wide, and efficient for long distance paddling. Having moderately hard chines to help carve a turn, it is quite responsive for its length. The building process involved laying thin quarter inch thick and three quarter inch wide lengths of timber over a series of stations. These stations were spaced along a strong back (usually a long length of four by two). I cut my timber on a Triton sawbench, with a thin curved blade to minimise wood wastage. The timber needed to be supported at both ends as it is important to get a uniform and even cut. Dealing with twenty foot lengths of timber required a friend to help with the cutting. The strips were laid longitudinally along the “skeleton”, and adjacent strips glued to each other. The hull and deck at the shearline are not glued to each other at this point, since the “skeleton” will need to be removed later. Depending on how much time and effort one wants to expend, creative patterns can be achieved with the various timbers. Once the hull and deck were completed, and the timber planed and sanded to a fine finish, the exterior was coated with fibreglass cloth and epoxy resin. 1 used six ounce cloth on the hull exterior, and four ounce on the deck and interior. Fortunately as a young teenager, I’d had experience building two fibreglass fiat water kayaks with my father and brother (mould courtesy of Jack Miller). Once the epoxy had cured, openings in the deck for hatches and cockpit were cut out, and combings built for them. The framework was pulled out at this stage and the interiors were glassed. The next stage, and at times, a difficult one, was joining the hull and deck back together with fibreglass cloth tape along the seam, inside and out. The hull and deck can distort from curing and shrinkage of the epoxy. Brute force, plenty of tape, and occy straps usually pull the join back together. End pours of epoxy and sawdust strengthened the bow and stem. You should now have something that resembles a sea kayak. After much sanding and fairing of the epoxy, six to eight coats of marine varnish were applied, giving the kayak a protective coating and sheen. All the odds and ends take some time, but the hard work is all over. I used three inch thick foam, epoxied on both sides, for bulkheads. Foot rests, seat, deck fittings, and rudder (optional) are an individual choice and can be built or purchased. Selection of timber is quite important, ideally you want timber slightly longer than the actual boat, although strips can be butted together. It should be knot free and straight. I did not accurately record the hours taken to build the kayak, but all up, approximately nine weeks off and on from start to finish. This included having to build the framework and source my wood and fibreglass materials. For anyone that is interested in building their own kayak, I highly recommend it. A couple of hours spent here and there during the winter months in a back shed or garage, and you’ll be rewarded with a beautiful craft ready for its summer launch. There is a wonderful sense of satisfaction paddling your own hand crafted sea kayak with the wood giving it a very special character. So, if you happen to see a wooden sea kayak out on the east coast of New South Wales / Victoria… somewhere, paddle over and say g’day. The “Royal Banquet” is an overnight paddle down the cliffs of the Royal National Park. The Saturday night camp is a shared banquet at Era Beach. Yes, we eat well! The following description is just one of many fine methods that will cause irreparable damage to a $2,400 two-man Tasman sea kayak. I personally demonstrated its effectiveness on a Crew expedition back in July. Step I – Get some really crazy people. I find that Turramurra Rovers are an ideal source. However, if hard to obtain, Sydney Uni Cavers are a suitable substitute. Our expedition involved five Turramurra Rovers (Brendan Elphick, Grahame Price, Patrick Mickan, Andrew Rennie and myself), one former 1st Turramurra Venturer (Sandy Smith) and one caver (Sushila Thomas). Make sure that no more than one participant has ever had open water kayaking experience. In our case this was Sandy. Step 2 – Find somewhere nice to destroy the craft. We chose the Whitsunday Islands. We were to spend ten days paddling around this tropical paradise. We snorkelled, fished, bushwalked and camped at some of the most gorgeous places I have ever seen. Step 3 – Pack some food. Noodies, peas, muesli, Deb, dried tofu and honey is about all you need. Try to catch as much fish as you can. We had great fun speaffishing for sharks with our paddles. I’m thinking of Operating a floating bakery for tourists up there in a few years time. Step 4 – Get some kayaks. We hired one two-man mirage from Sydney Uni Canoe Club, borrowed a second from a friend, and drove these to the Whltsundays on the roof of a ten year old red Volvo. We found it especially exciting if the roof racks are half rusted through and make loud creaking noises during the whole drive. We hired a two-man Tasman kayak at Airlie Beach. Step 5 – Practice your Eskimo rolls, low and high braces. We find resort swimming pools are ideal. They’re large and a nice depth. However, make sure all nuts and bolts in the cockpit are done up before you invert the kayak. We found this makes good snorkelling practice for the inexperienced. Step 6 – Pack all your gear into the kayaks. We started packing on Airlie Beach just after high tide down by the waterline. After 2-3 hours we finally had all the gear in. Following a feast at the local bakery, we returned to see that the tide had dropped 3-4 metres from when we started packing. The result was a painful haul of three fully laden sea kayaks over 100 metres of coral beach. After half an hour we finally set off for North Molle Island. Step 7 – Fish for breakfast. If you keep losing your hook and don’t expect to catch anything anyway, I find it’s just as fun to tie the line around the bait without re-hooking and just cast out again. Note, it’s not a good idea to accidentally roll up your sleeping bag with two day Old bait inside. Step 8 – Watch the sun set behind Hayman Island. This was the most beautiful sunset I’ve ever seen. It was shortly followed by the most amazing shooting star I’ve ever seen. The star burned for up to five seconds and had a bdght red flaming tail behind it. Don’t forget to make a wish! This is an amazing, fantastic place. Step 9 – In the event of bad weather, accept a lift on a passing yacht. On Day 5 we had a 50kin paddle into 35 knot headwinds in three metre swell in order to meet Andrew, our seventh paddler, arriving on Hamilton Island with our food for the second half of the expedition. This was ,clearly impossible, so we tied the kayaks to the back of a nearby yacht which was also heading south. However, off the coast of Hook Island a rope snapped in three places and the Tasman floated off on the crest of a four metre wave into the distance. There was no way the yacht was turning around in the conditions. I think it was at this moment that we collectively realised that of the three kayaks, only one was uninsured. Sure enough, it was the Tasman. Even more ironic, it was the Tasman that had the rescue beacon. It appeared that Grahame and Sandy had lost all their gear, not to mention the leftover food. We decreed that we weren’t to mention the “T” word any more, rather the lost craft was to be referred to with a hmmmm …. Someone would ask, “Where’s the can opener?” to be answered with a painful hmmmm ….. We spend the afternoon on the yacht with our new friends eating oysters, drinking wine and singing “Always look on the bright side of life”. Step 10 – Make an emergency overnight camp. The yacht dropped us at the first safe inlet after the incident. This was aptly named “Refuge Bay”. Fortunately, we still had our tents and a small quantity of chocolate. However with six people and only two two-man kayaks we had to be rescued by the nearest resort. Irs just as well for by this stage we were cold and very demoralised. The expedition appeared over. Step 11 – Eat a bloody huge breakfast. Scrambled eggs, bacon, sausages, tomato, toast and coffee. At the resort we bumped into two fellow kayakers who had heard of our rescue. The story they heard was that one of our kayaks had tipped, and that in coming to the rescue the other two kayaks consecutively tipped over. It’s amazing the way news spreads. Step 12 – Get stranded at the resort. Only one of our kayaks was still seaworthy so paddling back to the mainland was no longer an option. We spend the next two days trying to convince ferry companies to take our kayaks back. This was a highly frustrating two days. We did however manage to climb Whitsunday Cairn and play a bit of beach volleyball. It’s amazing though how boring resorts can be. Step 13 – Return to Aidie Beach to negotiate a Settlement with the owner of the Tasman. It was salvaged after breaking up into pieces on Hayman Island. We got most of our gear back, except for Grahame’s pack which had mysteriously disappeared. 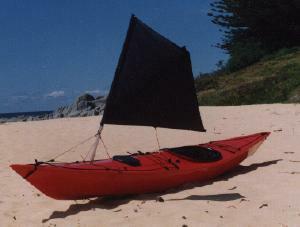 The owner wanted a new kayak transported up from Brisbane plus lost earnings until it arrived. We convinced him to accept one of our Mirages, buying its owner a new one when we returned to Sydney. Every problem we encountered brought a new challenge not to mention added stress, Overall it was an amazing experience (but costly). We got a hell of a lot out of it, mostly in terms of our personal development and the way that we bonded as a group in the times of crisis. We all decided at the end of the trip that we were in need of a holiday. Things very quickly moved on from there to encompass all sea kayaking skills as the number of club members increased. We realize that not all members have the opportunity to paddle as often as they would wish and paddling is the very best way to increase sea kayaking skills. The various books, videos and magazines on sea kayaking from around the world all contribute to a person’s sea kayaking skills and knowledge but let’s face it……sooner or later you’ve got to get into your boat and do it!!! At this weekend we have members who have paddled all sorts of kayaks in all sorts of conditions all over the world……and we want you to come along, get involved in the weekend and tap into this vast store of sea kayaking knowledge and skills. It can only make you a better paddler….and who knows, it may be the embryonic stage of a major expedition for you! The NSW Sea Kayak Club looks forward to your company at the 7th Annual Rock’n Roll Weekend . Honeymoon Bay is located on the western side of Beecroft Head within Jervis Bay. It offers protected waters paddling and easy access to a surf beach , spectacular cliffs and ocean waters. From Nowra, follow the signs to Currarong (about 35 kms). About 1 km before Currarong, take a right turn at the Point Perpendicular Lighthouse Rd and follow the signs to Honeymoon Bay (about 10 kms). At Honeymoon Bay, toilets and rubbish bins only are provided. You will need to bring fresh water and a stove with you. Open fires are not permitted and please do not use trees to erect clothes lines. The Park Rangers have given the Sea Kayak Club the exclusive use of the “Nowra Hill” area for camping at Honeymoon Bay. To find this area, drive through the camping area and turn in to the right after crossing the creek on a concrete causeway. We will have a series of information boards erected in the camping area. Please don’t camp near them if you like to turn in early!. This is the AGM/Guest Speaker area. Camping fees are $10.00 per person per night for the first 2 people on a site and $2.00 per person per night for extra people. The Sea Kayak Club will collect camping fees from members for the weekend. Note: As Honeymoon Bay is situated on Navy land, it is sometimes closed for defence exercises….as it will be until Friday 27th November. We have been assured that the area will be open for our use from Friday afternoon. However, in the unlikely event that it is not open, we will holding the Rock ‘n Roll Weekend at Currarong Caravan Park. The caravan park is on the left as you enter Currarong. It has good facilities including a kayak washing area and more importantly, creek access from where we can paddle straight onto the ocean. Currarong also has a mini supermarket, newsagent, cellars, take-away food shop and friendly staff at the local service station. If you’re coming in on Friday afternoon and the boom gate is down, please ask at the gatehouse if Honeymoon Bay will be opened that day. If not, proceed to the caravan park. Our program for the weekend kicks off at 9.00 am on Saturday but before I outline the topics, a note on a few things you may like to bring along. This year we’ll again have our BUY SWAP SELL board operating. Bring along your old/unwanted kayaking or camping gear etc and write it up on the board. Who knows!….someone may be looking for your stuff!!! If you’re going to practise rolling, bring along a face mask and maybe a wetsuit although the water temp. is rising nicely at the moment. Also….help us to help you in paddling skills by making sure that you fit your boat well. Get some foam sleeping mat and a roll of duct tape and go to work on your kayak seat BEFORE the weekend. A Three Part session which looks at Boat, Body and Paddle, and what you can do to make your boat positively zing along for longer!……in all conditions. Presented by Dirk Stuber, David Winkworth and Mark Pearson. Find out what these little gadgets can do for you in sea kayaking navigation! Guaranteed “techno-speak free” presentation by Andrew Eddy. Your 5 minutes of fame! If you wish to present in this segment, please see President Norm Sanders when you arrive and write up your entry on the information boards. Equal time for all. Forget surfing on beach waves for the moment. In this session we discuss tactics to get paddlers safely through the surf to the beach and out again. If you’re new to sea kayaking or surf seems to be your stumbling block in skills acquisition, don’t miss this session! This theory session on the beach will be followed by an on-water skills session. Presented by paddlers who have endo-ed and backflipped in the surf and now know what not to do! Just how do you keep your boat upright in the surf and other difficult paddling environments? This on-water skills session will give paddlers something to practise in the surf in the afternoon. Valuable paddle stroke skills. Don’t miss this session. For doubles and singles alike. Paddle to Target Beach and put the surf entry and exit skills learned in the morning to the test under the watchful eyes of experienced club paddlers. If surf work is a problem for you, attend this session! In Honeymoon Bay, learn to roll you kayak and see your confidence in your boat soar! Note: The above two afternoon sessions will be run concurrently. We know that club members detest formality….and would rather be paddling…… but we just have to have a meeting! Please come along, participate and contribute to the meeting. Your input will determine the course of the club for the next 12 months. Drinks and nibblies provided and we promise not to keep you too long! What is the Adiabatic Lapse Rate? — Our Guest Speaker is well qualified to answer this and thousands of other questions about our weather! Steve Symonds is a Publicity Officer with the Bureau of Meteorology (Dept of Environment and Heritage) and has been with the Bureau for 30 years. Steve’s presentation will cover all elements of weather affecting sea kayakers on the NSW coast – southerly busters, east coast lows , dominant summer and winter weather patterns and more. Steve will also leave with us an array of handouts which may help us all better understand the causes of the rotten weather we sometimes paddle through! How can we spot and avoid nasty weather? Come along and listen to Steve and we’ll all find out! For committed and occasional sea paddlers, this is a presentation not to be missed! David Whyte will be showing some slides from a 4 day trip down the Myall Lakes – a great place to start your first overnight trip. And slides from a Recent Bermagui to Tartha trip which was highlighted by many whale sightings. If you can struggle out of your sleeping bag at dawn, come along on an early morning paddle out to Point Perpendicular or Bowen Island. This is always the best time to paddle. Paddle grade will be (2) and the destination will be weather dependant. Check information boards in the camping area. If any paddler would like to be assessed for Board of Canoe Education Sea Proficiency Award, this is a good time to do it. Don’t forget to bring your log book along if you have one and your first aid certificate. Please see David Winkworth or Frank Bakker on the Saturday. This is what everyone is coming for isn’t it! A host of fun events and the possibility of seeing Mark Pearson doing a John McEnroe when he realizes we’ve half sawn through his sail mast! Brush up on skills learned during the weekend – perhaps have a go at a re-enter and roll manoeuvre. Some time ago, the OSD evaluated the Princeton Tec Solo Headlamp for the Newsletter. To his dismay, the OSD found that the Solo was dim and went through batteries at a great rate. He sent off a letter to the Princeton Tec people in New Jersey. He immediately got a reply from the Vice President of Marketing, who said a new unit was in the mail, no problem. When he got the new headlamp, which worked beautifully, the OSD started experimenting. He isolated the difficulty by swapping components and found that the metal gauze conducting strip on the back of the battery case had a high resistance. He fixed the unit with a piece of aluminum foil and sent an e-mail to Princeton Tec to let them know about the situation. The net result is that the OSD now has two Solo’s, Princeton Tec has rectified the manufacturing difficulties, and there is a warm glow all around. It’s really good to find a firm that gives that kind of service. It’s AGM time already. The year has flashed by, punctuated by some excellent paddles. The calendar is bigger than ever, ably coordinated as it is by Andrew Eddy. I don’t know how much he had to do with it, but there are a lot more events in the Sydney area. This is good to see, as most of the club members live in region. Unfortunately, the once hyperactive Canberra Pod seems to be wasting away. To be sure, they are still in evidence, but the fire seems to have gone out of their bellies. Some have given up completely and retreated to flat water paddling. (The Wollongong mob have dropped off the screen entirely.) Fortunately, Canberran David Whyte is still firing and hitting his stride as Newsletter Editor. The Newletter is looking very professional and has benefitted from a new scanner. Another Canberra denizen, Doug Fraser, has managed to sandwich some epic sea kayak feats in between his jobs which involve managing the NSWSKC treasury and running the Army. He does magnificently at both tasks. See you at Honeymoon Bay. OK. The lack of a rudder was obviously not a problem. The OSD studied Doug’s rig. Typically, the mast was stepped unstayed in a hole in the deck just in front of the cockpit close enough to be reachable. This meant that the boom hit him in the face during a gibe and there was no room to swing a paddle for an eskimo roll. Obviously, the mast needed to be further forward. The OSD’s eventual solution was to pivot the mast on the foredeck on a universal joint (a standard sailing dinghy tiller extension fitting). Two Spectra stays lead aft to fittings on the deck. A forestay running through a small pulley at the bow forms a triangle with the stays to hold up the mast. The lines are tied to a saddle pop-riveted to the mast a foot above the base. The rig jumps up into position by pulling on the forestay line which leads back to a clam cleat on the deck near the cockpit. The sail itself required some more thinking. The OSD rejected spinnakers immediately. They are cantankerous at best — at worst, downright dangerous. 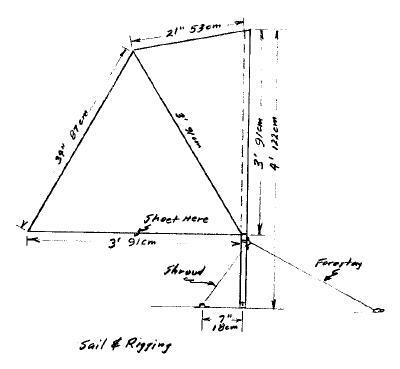 He wanted more control and settled on an ancient design called a “Sprit Rig” in which the quadrilateral sail is supported by the mast and a sprit (in this case, a windsurfer sail batten) which extends from the mast to the peak. Another batten forms the boom. The sheet is fastened halfway along the boom and leads to another clam cleat near the cockpit. The OSD sewed a sleeve into the leading edge (luff) of the rip-stop nylon sail to fit over the mast and other sleeves for the sprit and boom. 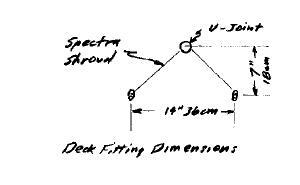 He made the length of the sprit and boom identical and the same as the dimension from the point of attachment of the stays to the top of the mast. When he drops the sail and furls it, all the hard bits are the same length which makes a neat package. An unexpected advantage of the sprit rig is the ease of reefing if the wind comes up. The OSD sewed a webbing loop at the top of the sprit so that he can slip it over the masthead, to quickly cut the area by half. The sail is fairly small anyway, about one square metre. However, even this can be a handful in strong winds and a chop. In an excess of foolhardiness, Mark Fishkiller Pearson and the OSD once swept by the Gabo lighthouse in a wind which the keeper later reported as 39 knots. It was an exhilarating, if scary, ride. In light winds, little steering is necessary. The forward position of the rig seems to balance the normal tendency for a boat to head into the wind (weather helm). As the wind picks up, a bit of stern rudder with the paddle is useful to counteract the occasional broach on a wave. Stern rudder combines with bracing as conditions become more severe. If things really get out of hand and the OSD finds himself upside down, he simply eases the sheet and uses a slow Pawlata roll to allow time for the sail to flow with the movement. There is plenty of room for the paddle to swing inside the sail rig. Once right side up again, The OSD pulls in on the sheet and continues on his way with a minimum of drama. Incidentally, the OSD finds that the rig won’t go to windward, but he expected that — the best he can manage is a reach.